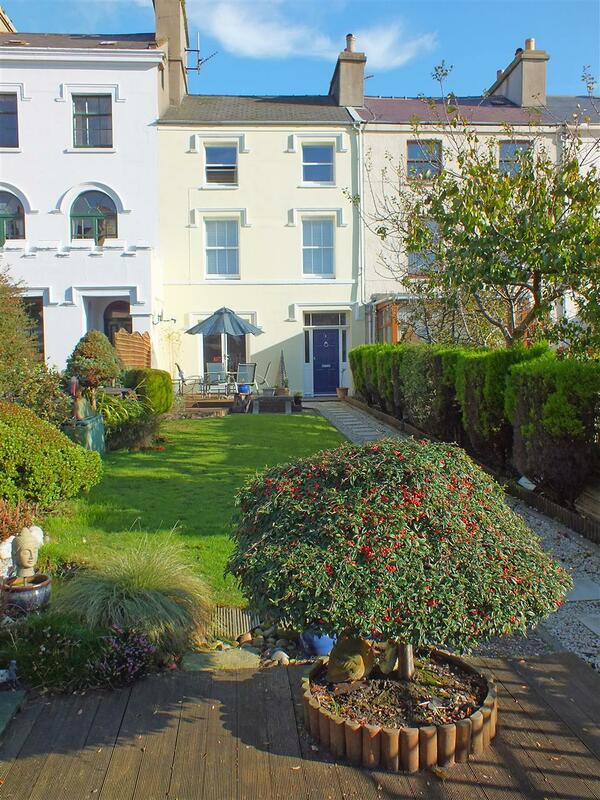 Attractive Mid Terrace 3 Bed Townhouse in a Convenient Central Location. On Main Bus Route with Local Shops and Schools a Short Walk Away. Easy Access to Douglas Prom, Town Centre, Theatre & Restaurants. Modernised Throughout Whilst Retaining Character with Period Features. Briefly Comprising Vestibule & Spacious Entrance Hall. Good Size Lounge with Access to the Front Garden. Light & Spacious L Shaped Dining Kitchen with Utility and Cloakroom Off. 1st Floor - 2 Generous Double Bedrooms & a Large Shower Room. 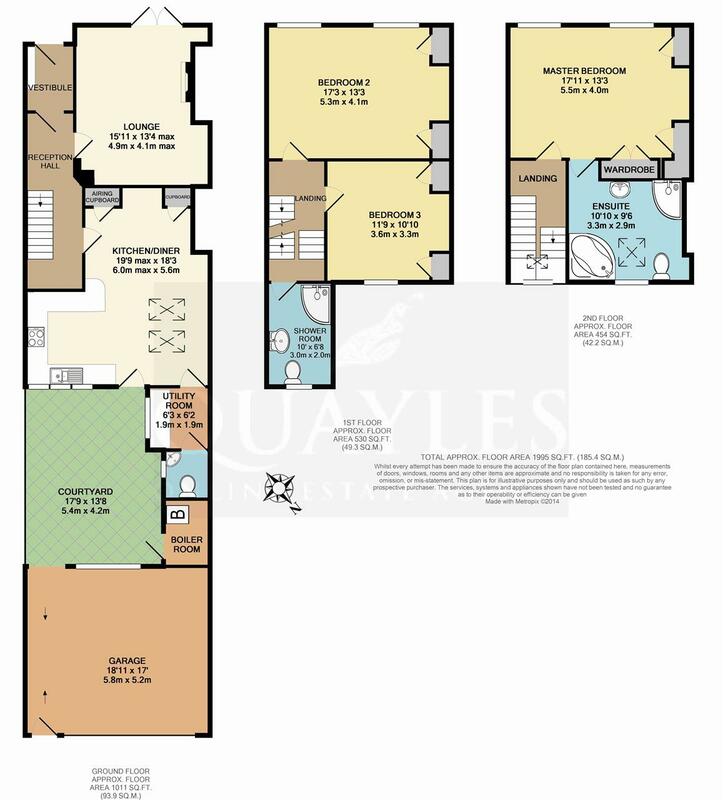 2nd Floor - Full Width Bedroom with Fitted Wardrobes & En Suite Bathroom. Oil Fired Central Heating & a Combination of uPVC & Timber Framed D/Glazing. Outside Store/Boiler Room and a Double Garage Accessed Via Stanley Place. Enclosed Rear Courtyard and a 75ft South West Facing Lawned Front Garden. From the Sea Terminal, travel along the Promenade in a Northerly direction, passing the Gaiety Theatre and turning left immediately after the Villa Marina with it's well kept public gardens, shops, restaurant, gallery and cinema, on to Broadway. Continue through the traffic lights and the property will be found on the right hand side, being clearly identified by our For Sale board. Original panelled timber entrance door with glazed side and top lights. Original cornice and tiled floor. Cupboard housing the consumer unit and electric meter with dual power point. Coat hooks. Original stripped pine, part glazed inner door and side lights. A spacious area with open storage under the stairs. Quality oak strip flooring continues into the lounge. Coat hooks. Power points. Partial cornice. Telephone point. Stripped pine, panelled doors to the lounge and dining kitchen. A good size room enjoying a pleasant outlook over the garden via uPVC doors, which lead out to a decked patio. Fireplace with wooden surround, marble style background and hearth and an inset coal effect electric fire. Multiple power points. Telephone point. A large open plan, L shaped space which is naturally separated into two areas. Having space for a large dining table and chairs together with a free standing dresser unit. Built in shelved cupboard with radiator (ideal linen cupboard) and a further larder cupboard. Central recess with space for an american style fridge freezer. High level display shelves. Ceramic tiled floor continues to the kitchen. Pitched roof with two 'Velux' windows providing plenty of natural light. Part glazed door to the rear courtyard. Door to the utility room. Fitted with an excellent range of light Beech effect wall, base and drawer units together with a wine rack and wood block effect work surfaces incorporating a 1 1/4 bowl stainless steel sink with mixer tap. Inset 'Schott Ceran' ceramic hob with a pull out filter above and a stainless steel electric oven below. Plumbed for a dishwasher. Background tiling, counter lighting and multiple power points. Recessed downlights and a double glazed, timber framed rear window. Glass display shelves. Timber framed, double glazed window. Work surface with space for washing machine and tumble dryer beneath along with one other appliance if required. 'Velux' roof light set within a pitched roof. Ceramic tiled floor. Multiple power points. Door to the cloakroom. Fitted with a high level flush WC and corner hand basin with lever mixer tap. tiled to mid height. Obscure glazed timber framed window. Ceramic tiled floor. Stairs continue to main landing. Door to family bathroom. Fully tiled walls and floor complement a white 'Heritage' suite of pedestal basin and WC. A glass block enclosure surrounds a walk in shower (fully plumbed and thermostatically controlled) with glass shelf and shaped base. Wall mounted mirror with shaver light and glass shelf. Chrome heated ladder towel warmer. Obscure glazed uPVC window. Stairs continue to the second floor with a uPVC window at the half landing providing natural light. A double room with built in wardrobes to either side of the chimney breast. Rear facing uPVC window. Multiple power points. NB measurement excludes wardrobes. An exceptionally large room with dual, timber framed double glazed windows to the front elevation. Built in wardrobes to either side of the chimney breast. Multiple power points and telephone point. NB measurement excludes wardrobes. Space for a small study area. 'Velux' roof light. Access to the loft. A generously proportioned room with dual timber framed double glazed windows to the front looking out towards the rose gardens. High angled ceiling to the front section. Two built in wardrobes and a further double wardrobe with a high level shelf, hanging rail and open storage above. Television and telephone points. Multiple power points. Door to the en suite bathroom. NB measurement excludes wardrobes. A superb room which has been partially tiled in soft neutral tones to complement the luxury suite of large corner bath with a central mixer tap together with a wall mounted basin with mixer tap and glazed shelf and mirror above. Push button flush WC and a large, P shaped enclosure housing a hand held spray, over head nose and jet sprays. Space for free standing storage units. 'Velux' roof light and an obscure glazed uPVC rear window. wall vent. The property is accessed via a heavy iron gate and long gravelled pathway with inset stepping stones which lead to the main entrance. Directly to the front of the property is a low level deck which enjoys afternoon to evening sunshine. A large central lawn leads down to a further deck with a water feature and planted trellis, providing privacy and shelter. This area enjoys the early morning sunshine. Borders planted with shrubs and flowers. An enclosed area which has been gravelled with stepping stones for ease of maintenance. Night light. Large oil storage tank. Access to the double garage. Accessed via a roller shutter door in Stanley Place. Additional door to the front with a walkway and steps leading out into the rear courtyard. Space for two average size cars and a motor bike. Security lighting and power points. Pitched roof. A useful store area accessed from the rear courtyard. Oil fired boiler. Shelving. Mains electricity, water and drainage. Oil fired central heating. Combination of uPVC and timber framed double glazing.